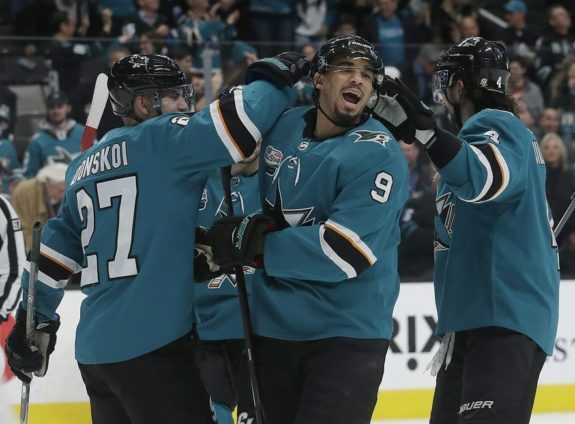 SAN JOSE, Calif. — Evander Kane and Joonas Donskoi each scored two goals, Erik Karlsson had three assists again and the San Jose Sharks defeated the Edmonton Oilers 7-2 on Tuesday night. Marcus Sorensen, Brent Burns and Joe Thornton also scored for San Jose, which has won four straight and six of seven — totalling 36 goals during that stretch. The Sharks are 11-2-2 over their last 15 games. Karlsson has at least one assist in 14 consecutive appearances. He has 25 points (one goal, 24 assists) in that span, and three assists in each of his last two games. San Jose coach Peter DeBoer missed the game because he was ill. He scored the first goal of the night at 6:37 of the first period when his shot bounced off the back of defenceman Caleb Jones’ skate and slid past goalie Cam Talbot. Later, a pass by Burns ricocheted off Kane’s skate and into the net, giving San Jose a 4-1 lead at 6:32 of the second. NOTES: San Jose leads the season series 2-1. The Sharks have outscored Edmonton 14-6 in the last two meetings. … Donskoi has scored seven of his 13 goals in his last six games. … Oilers C Ryan Nugent-Hopkins played his 500th career game. . With an assist on Chiasson’s goal, Connor McDavid has 14 points (five goals, nine assists) over his last eight games. . The Sharks are one win shy of 1,000 in franchise victory.